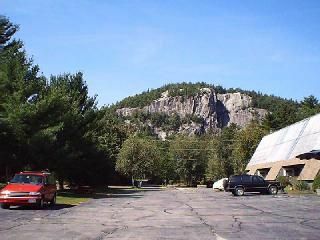 three level condo,North Conway/ Specials! This cozy comfortable condo has three levels with two bedrooms.The master bedroom is located on the third level with a king size bed and a full bath. There is also a small futon for the little ones. The second level has living room and kitchen with another full bath. There is also a pull out full sofa on this level. The downstairs level has washer and dryer with bedroom. This bedroom has a queen size bed, great for the kids. They have there own private floor to play. There is also a walkout to the back yard on this level. Condo has cozy wood stove. Condo includes , vcr, washer and dryer, dishwasher,all kitchen utensils, all linens and sheets, cleaning included( we do ask that you maintain daily cleaning) Each bedroom has a television with vcr, cable, wifi,and radio Just pack your clothes! Inquire about our specialr ate reduction due to the economy! Please note we recommend taking some extra towels int he summer as cleaning leaves roughly a half of dozen due to the busy season and amount of turnovers! DUes to the busy season, cleaning leaves six towels. There is also a washer and dryer in the unit. It is suggested you bring a few extra towels in the event you will be swimming etc. table pulls out to fit six comfortable, spare chairs in closet on lower level if needed. The property was very clean and comfortable. Great location. Within minutes of everything North Conway has to offer. We would definitely stay again. Nice condo for a girls weekend. I’d definitely recommend this place to others. Everything was great! The only issue I encounter is the drainage in tub and sink was very slow. Also the windows needs to be cleaned. Other than that, the location is great and the house felt like home. Very nice place to stay and so accessible to town and area mountains. Donna was wonderful and very accommodating! Thank you so much! Thank you, I'm glad you enjoyed your stay. It was a pleasure to rent to you. mobile right from your door to the best and longest trail in NH. Please note that Sunday check outs are 9 am due to turnovers. There are no pets allowed at this property due to allergies, I hope you understand.